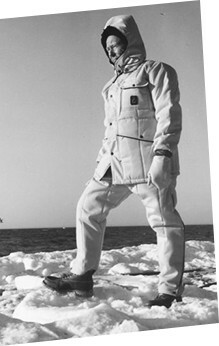 The Parkas of the Women's Fall Winter Collection 2018 are characterized by the history and the heritage that the brand RefrigiWear carries; this piece has indeed always been our iconic garment, inspired by the American style and the brand history; it has been widely used in the workfield at the Meatpacking District and Fulton Fish Market in New York. The Women Parka collection represents the perfect meeting point between the historicity of the brand and the research and development that we offer today in our garments. Our Parka is ideal for those times of the year when temperatures become stiffer, perfect as it warms and protects from water, cold and wind. Choose your new Parka or discover more about our collection! The Autumn Winter 2018 collection offers a wide choice of parkas that varies from the classic of our original line, made contemporary with the use of advanced fabrics, rather than a modern fit, and sophisticated furs that embellish the jacket, to some more casual and innovative revisions, possible thanks to the exhausting research for technologically advanced materials and fabrics. Colors range from very classical and elegant dyes, with some more humorous and fun variations for those who want to dare more. The tones of blue, gray and black are definitely appealing but they alternate definitely well their stylistic proposals along with modern shades to discover.